If we were having coffee, I would sit for a while and chat with you about my last couple of weeks. How do you take your coffee or tea? Mine today will be medium Colombian roast with a nice dollop of Bailey’s Tiramisu creamer. In the states, we celebrated our nation’s 239th birthday on July 4th. I sometimes wonder if many Americans are really patriotic or just love to blow off fireworks any chance they get. Perhaps a little of both. The Leisure Link, my link-up party, took a short holiday hiatus for the weekend and re-opened on new days. I have been very happy with the posts shared in the link-up and have seen new blogging friendships form as a result! The link is open Thursday through Saturday, so please stop by and link a post related to leisure and recreation. 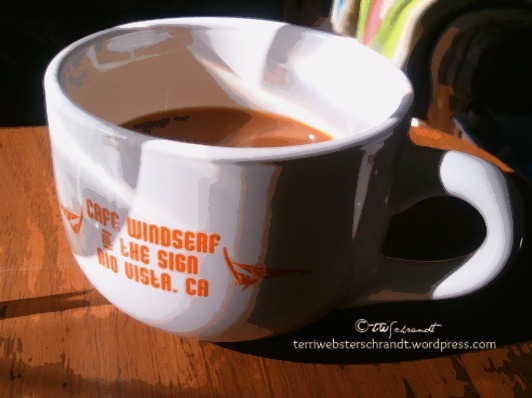 If we were having coffee, I would tell you that I am writing a couple of sponsored posts. One is for a family member’s new fashion accessories line, Above-Time. Take a look at the post A Well-Garnished Life. He enjoys my blog and asked me to be his official blogger. It is really awesome to get paid for writing. I have another sponsored post coming up next week for another organization. Also this week, I now have 600 followers on my blog. I also have been featured on some link-up parties and this is validation that I am doing the right thing by writing this blog. I seriously could spend all day just on the care and feeding of my blog. I may be semi-retired but I am going back to teaching as part-time faculty at my university, and need to get busy preparing for classes. This is where I am surprised at how quickly time has passed. I find it hard to believe that not only are we half-way through the year, but we are over the halfway point for our windsurf season. Windsurfing basically ends after Labor Day in early September. Sad face. We have had great wind all season, very different from summer 2014. If we were having coffee, I would ask you, speaking of time, if you ever applied for loans from your bank. After several months, we finally have our home equity line-of-credit approved for our upcoming room addition to our “master” bedroom. Don’t get me wrong, we have a great financial institution and I have excellent credit, but they are SLOOWWWW. In six months, I should be blogging from my new office in the new addition. There WILL be blog posts through the process for your entertainment. As much as I love summer, and we are half-way through July, I do enjoy looking forward to the Fall, which will be here before we know it. I hope you enjoyed coffee today with me. Until next time! Join Part-time Monster’s Weekend Coffee Share feature every Sunday. I havea number of posts to share this week. Here is mine for today. What an inspiring post for any blogger. Congratulations on your paid writing job. What an exciting time for you. 600 followers demonstrates lots of time and creativity invested. And a new addition is just way cool. My best wishes to you on this very busy period of your life and I look forward to following your continuing adventures. Congrats on all the cool things happening with your blog and teaching! Keep it up! You sound nice and busy! I bet you are excited about having an office to blog from… and for sure keep us updated. Seeing others in the middle of home improvement projects makes me feel better about my own! Oh, please don’t say that fall will be here before we know it – it’s just getting summery around here. We had “June Gloom” into early July. It’s lovely today for those enjoying Comic-Con and Over-the-Line. Oh yeah, comic-con! I would love to be around to see SD all encoded in the fun. We’ve had some overcast days here too, that reminded me of the June gloom. Congrats on 600, and getting paid to write! What?? You’re living every writer’s dream! Thanks for the encouragement! wow you have a lot going on! New room additions, teaching, blogging- looking forward to seeing the new office in progress!